Camp Hope brings kids to their imprisoned fathers for one unforgettable week. Thomas Hill Jr. stands near the doorway in the linoleum room and tries to pick out his father from a group of inmates. The men stand from plastic chairs as the 11 other campers run to hug them. Thomas, 13, last saw his father three years ago when he was a skinny man with cornrows. As Thomas scans the room, no one here looks like that. Earlier that morning, Thomas left a cabin bunkhouse on the Pennsylvania-Maryland border that’s normally used by Christian Bible-campers. 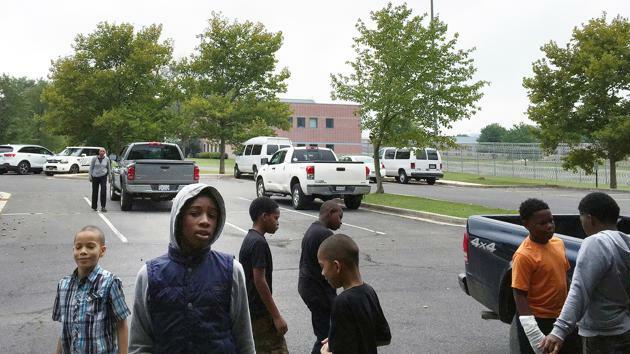 Along with the other boys and girls, nearly all from Baltimore, Thomas boarded one of two white vans. Down a mountain road they drove, bound for the Federal Correctional Institution in Cumberland, Maryland, where all their fathers are serving prison terms. It was the first day of Camp Hope, a weeklong program run by Washington, D.C. activist Carol Fennelly. For 14 years, kids have come to FCI Cumberland, and each year Fennelly sees the subtle changes it makes. During their visit, the kids will paint a mural, cut construction paper, or write in a journal with their fathers, then return to the mountain campground for a slip-and-slide, a hay ride, or s’mores by the fire. The camp operates on a simple notion: that some good must come when children and fathers spend time together—even if it’s in prison. Listen as one camper talks about first seeing his father in prison. There’s little information nationally on the impact of parental incarceration, though more than 2.7 million children have a parent on the inside—including one in every nine black children. More than 90 percent of the prisoners are men. But there is a surprisingly small amount of information on what happens to a child whose father is incarcerated. We do know that nearly half of state prisoners lived with their children before their arrest, and that more than half were the primary breadwinners. One 2010 study found that a family’s income drops 22 percent after parental imprisonment, leaving the child in greater chance of a life in poverty. Less studied is the emotional toll, but that’s precisely what concerns Fennelly. Often, families lie about what happened to a child’s father, so the child can carry the stigma of a missing father, hiding it from friends at school. A child with an incarcerated parent is three times more likely to suffer from depression, and kids with a parent in prison are also more likely to show aggressive behavior. In the prison visiting room, fences and barbed wire in the near distance, Thomas's billowy shirt and oversized sweatpants swallow his rangy frame. He looks concerned, almost lost. Then, at the far end of the room near the vending machines, he spots his dad. “I thought you was shorter,” Thomas says to his father after they hug. In the seat beside his father, Thomas fidgets and is overcome with a smile, though he stares at the floor. His father, now muscular and with short trimmed hair, looks forward, turning only when he asks his son a question. Their conversation is warm, but shyly formal. Thomas Sr. spent the previous year on good behavior to qualify for the camp visit. Some of the other prisoners had participated before, and after a friend told him about it, he completed a required parenting course, then helped coordinate the paperwork his son’s mother needed to sign. Sitting beside his son, he held a sheet of paper on which he’d written 15 questions he wanted to ask him. How is school? Does he still play basketball? What does he want to be when he grows up? All the questions a father would have answers to, were he around. Thomas Sr. grew up in Baltimore, raised by his mother because his own father was in prison. He quit high school shortly after his second child was born. He was 20 when his mother, Natalie Shuler, first learned her son had been robbing banks. “He wanted money for them,” Shuler says, referring to her grandchildren. 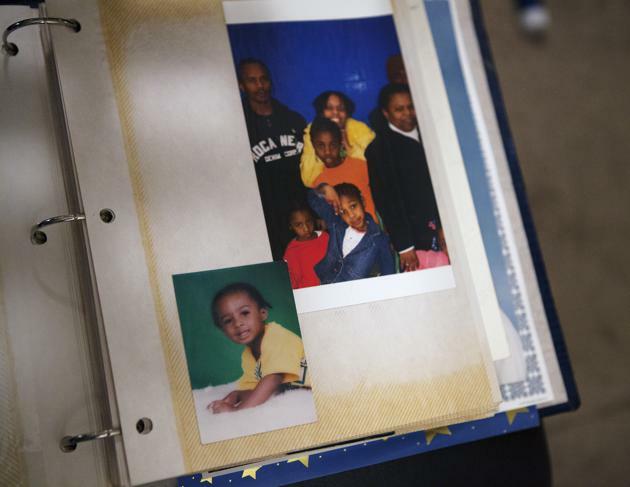 When Thomas Jr. was 7, six years ago, his father was arrested. In those six years, he’s been moved to almost as many prisons, Shuler says, which has made visits nearly impossible. Thomas Sr. asks his son why he didn’t write. “Look, your mother gives you an allowance, right?” he says. “Not no more,” Thomas Jr. replies, squirming in his chair. “I don't like writing,” Thomas Jr. says. The prisoners and kids spent the rest of the day decorating small waste bins with construction paper and glitter that would later become drums. The fathers performed a skit. They sang a song a prisoner wrote. It was almost hokey, and gradually it seemed completely normal that these men, many in prison-gray sweatshirts, felons and former robbers and drug dealers, should be allowed to spend time with their children. That temporary but lasting connection between these fathers and their children was Fennelly’s major motivation. She became a famous activist in the 1980s when she fought to bring attention to the homeless. In 1997, she began an organization to help the children of incarcerated men. Before the age of Skype, she held video conferences with children and their dads. She started a program for prisoners to record themselves reading children’s books. Then came Camp Hope. Fennelly runs the same camp in North Carolina. She says prisons in California and Texas are looking to duplicate it. And though she has collected almost no quantitative data, after kids spend a week with their fathers, she says, their grades rise “almost immediately” and the kids become more relaxed. Just before it's time to leave, the fathers and kids pull their chairs in a circle and write a poem. “My number-one son,” reads the first line of Thomas Sr.’s poem. It ends, “I love you son.” Thomas Jr. says goodbye. He hugs his dad. As Fennelly herds the campers out the door, he lingers. “All right, Dad,” he says.